Yay! 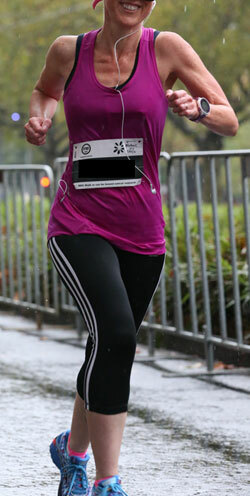 I crossed my first fun run outside Sydney off the list on Sunday in the Mother’s Day Classic. I was really tempted to enter last year when we were in Melbourne, but decided against it and was really pleased that I did, because it was absolutely bucketing with rain. Saturday in Melbourne was glorious and warm and sparkling. On Sunday we awoke to pouring rain – like, torrential rain. We were staying pretty close to the route so I was undeterred and found myself completely drenched to the undies within about 5 minutes after leaving the hotel room. It seemed rather pointless to wear rain gear, which was good as I didn’t actually have any with me. There were lots of participants in the 4km run, but the atmosphere was a little flat – most probably because of the rain. Seriously – so. much. rain. I’d brought along a protein ball for brekkie to take with my anti-inflammatory, but didn’t have time to grab a coffee before I left the hotel. I felt like I was struggling quite a bit – I hadn’t realised how the lack of coffee would impact me (a lot). I’d expected the route to be very flat, so was surprised to be confronted by a steepish hill quite early on. I usually try to pick people to catch and pass, but this time I just concentrated on trying to keep a pace of 6:30 or under. No coffee and being drenched to the skin are not ideal combinations! So I was really, really thrilled to beat my goal time and my stretch! And I finished in the top 21% of all participants and the top 15% of my age group (pleasing because I am at the VERY old end of my group). Also surprising and pleasing was that my cadence was all green – normally I have many orange dots – which is not good. Maybe I need less coffee more often. And I am chuffed to have another photo of myself smiling while running – I still can’t quite believe that those are my arms. All the muscles! I have no idea where run #2 will be. I think at this point Japan is probably a bit of a stretch. Most likely I’ll be seeking out something in the Nation’s Capital. Thank you! I’m pretty pleased with my progress. I do wish I had been up to doing the 8km – but I think TheUniverse was looking after me – running in all that rain would have been horrendous. I’m in Japan in early September so October should be completely do-able! It looks really fantastic – except for those hills, which look a bit daunting. I wouldn’t be at all concerned with keeping pace, you’re the one with the medal from this! The only daunting hill is the 100 metres at the start but personally I have no problem in walking the hard bits. I know you are more driven than me but since I have not run 100m in more than 6 months I don’t think there is any question that you’ll outpace me!